Take a seaplane to kickstart your exploration of Hamilton Island and stay the night at this luxe resort before meeting your yacht. Cruise to Hook Island, where you’ll anchor in the fjord-like Nara Inlet. 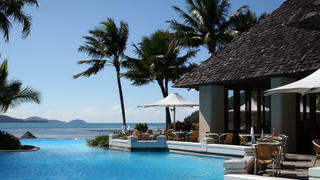 Ashore, explore 8,000-year-old aboriginal caves or, in the rainy season, splash in cooling rock pools and a waterfall. Later, relax in the spa surrounded by lush green mountains, one of the best spas in an adventurous location. Play with water toys on calm waters, and then head for Stonehaven, another sheltered bay on Hook that’s surrounded by high peaks. 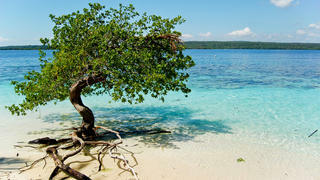 En route, stop at jewel-like Langford Island for a picnic on the perfect white sand spit and then snorkel or simply laze. Stonehaven faces west so expect spectacular sunsets. Take part in true Aussie tradition and barbecue tonight. Hook Island is serrated with coves and you’ll move to the aptly named Butterfly Bay at the north end. Enjoy rainbows of coloured fish in the water and, at midday, picnic under a mangrove tree surrounded by squadrons of butterflies. Don’t forget honey to tempt these tiny creatures to your fingertips. With no city lights, the stars are spectacular at night. 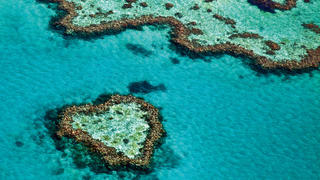 Heading south, stop at Border Island, where the snorkelling in Cataran Bay rivals the best of the Great Barrier Reef. 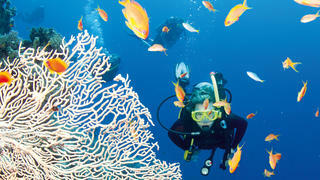 Surrounded by forests of eucalyptus, you’ll swim among colourful angelfish. 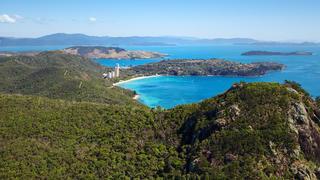 Continue to Whitehaven beach, with clear aqua waters and four miles of soft silica beach. Take the tender to Hill Inlet, with indescribable whirls of sand and tide. Have dinner on deck tonight. Today, you’ll move around to Cid Harbour on Whitsunday, where you may see dugongs – gentle marine mammals that reach 2,000 pounds and 70 years – as they snuffle for grass on the bottom. 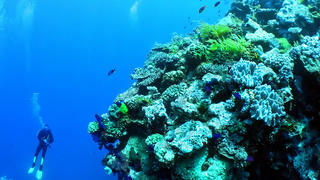 This is also a popular haven for sea turtles. 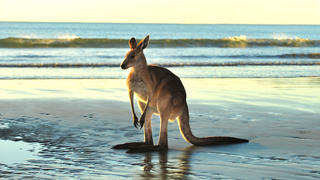 Ashore, you may see rock wallabies, isolated on the island 10,000 years ago. You’ll return to Hamilton Island Marina early to catch a helicopter or seaplane for the Great Barrier Reef, where you can spend the day snorkelling, picnicking and loafing on the beaches; among the best reasons to visit the reef. You’ll return tonight happy and tired – you may want to revive at the spa and then dine at one of the elegant restaurants ashore. Start early and you can tackle the Hamilton Island Golf Club course on its own nearby island, a Peter Thomson-designed 18-hole championship par 71, while kids can enjoy miniature golf. Full resort facilities are available, including Catseye beach, tennis courts, multiple pools and shops with local art, fashion, and jewellery. Your seaplane will return you to the mainland.